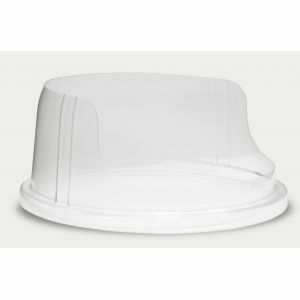 Transparent protective plastic dome for cotton candy machine RoboJetFloss. 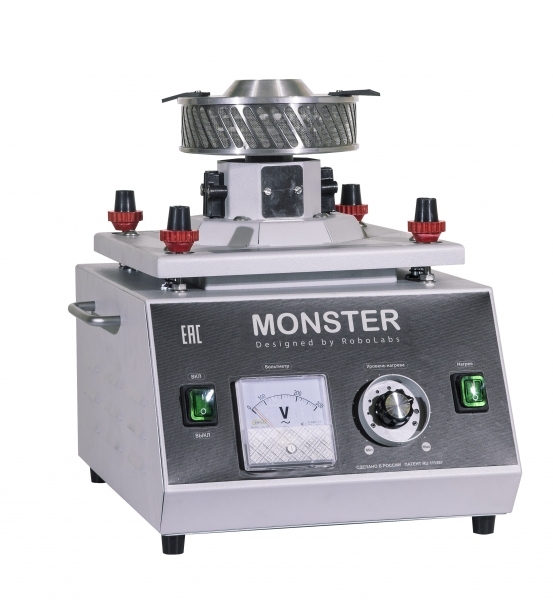 Designed for cotton candy machines with a catcher diameter up to 670mm. Cotton Candy Machine with a plastic floss pan. Heating by a tubular heating element. A spring suspension of a motor running gear eliminates vibration transfer to a cabinet. Two pair of brushes. A safety device. Secure fixation of the running gear for transportation. A meshy diffuser. 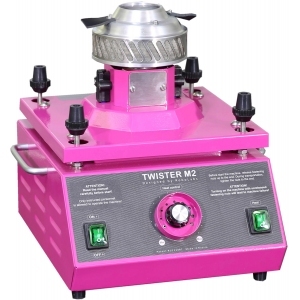 Cotton Candy Machine for commercial production, high output – 7-8 kg/h, heating by T.H.E. 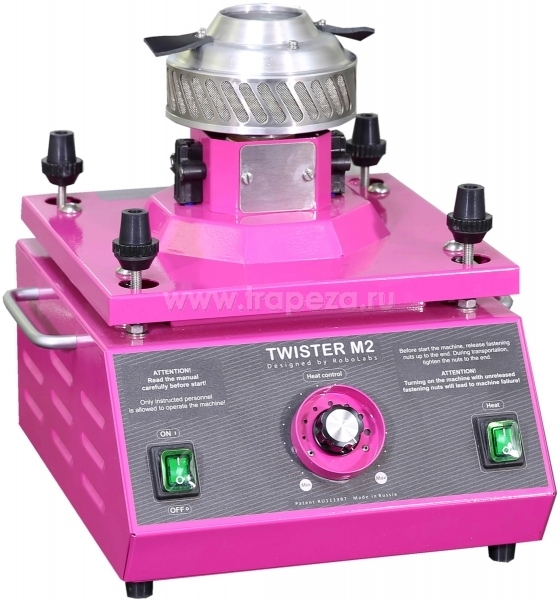 Cotton Candy Machine for commercial production. 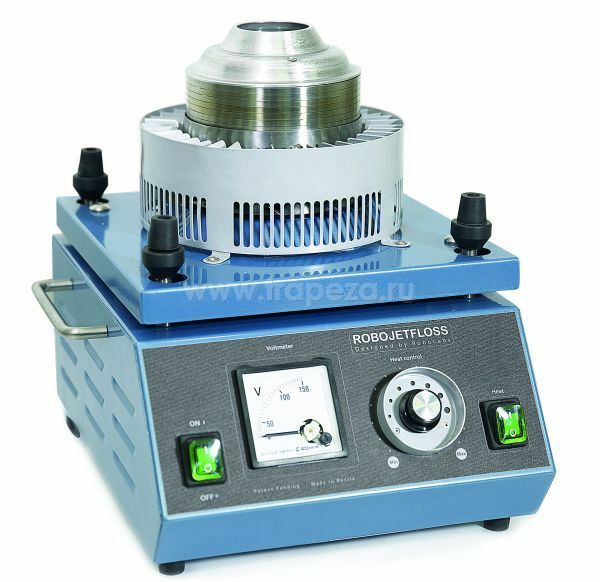 The machine has high output – 7-8 kg/h, heating by a tubular heating element. 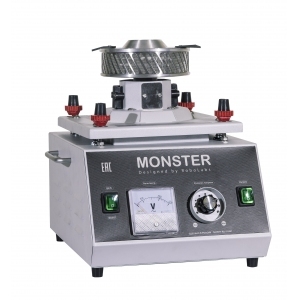 The head capacity – 700gr. Time for making one portion - 20-25 seconds. Time for "cold" start – less than 30 seconds. This machine has a new head design to make assembly and disassembly easy. A spring suspension of a motor running gear eliminates vibration transfer to a cabinet. Two pair of brushes. A safety device. Secure fixation of the running gear for transportation. The head rotating speed – 2750 revs per minute. A meshy diffuser. Design features: an adjustable heat control, a heat indicator (an indicating voltmeter), the control protection, handles for transportation, a window for brush assembly maintenance, the silver metallic painted cabinet. Equipped with a plastic floss pan dia.660mm, a grip stabilizer and a set of clips for the stabilizer. The machine dimensions without a floss pan - 440х420х410mm. Candy floss leaves the machine upwards in an even, steady and powerful flaw, allowing making cotton candy servings of unlimited size, up to 2 meters (6,5 ft) in diameter. Output: up to 5 kg/h (11lb/h), heating by a tubular heating element. The spring-loaded supports soften vibration that arises while motor in operation. Due to unique and patented design, the equipment allows operation under high ambient temperature and excessive relative humidity. Design features: protected heat control adjuster, incoming power indicator (an indicating voltmeter), handles for transportation, a window for brush assembly maintenance, blue painted cabinet. Equipped with aluminum floss pan dia.500mm. Candy floss leaves the machine upwards in an even, steady and powerful flaw, allowing making cotton candy servings of unlimited size, up to 2 meters (6,5 ft) in diameter. Output: up to 5 kg/h (11lb/h), heating by a tubular heating element. The spring-loaded supports soften vibration that arises while motor in operation. Due to unique and patented design, the equipment allows operation under high ambient temperature and excessive relative humidity. Design features: “Quick Start” button, protected heat control adjuster, incoming power indicator (an indicating voltmeter), handles for transportation, a window for brush assembly maintenance, blue painted cabinet. Equipped with aluminum floss pan dia.500mm. Candy floss leaves the machine upwards in an even, steady and powerful flaw, allowing making cotton candy servings of unlimited size, up to 2 meters (6,5 ft) in diameter. Output: up to 7-8 kg/hr, heating by a tubular heating element. The spring-loaded supports soften vibration that arises while motor in operation. Cotton Candy machine with a vertical candy floss supply. Output - up to 5 kg/h, heating by a T.H.E. Candy floss leaves the machine upwards in an even, steady and powerful flaw, allowing making cotton candy servings of unlimited size, up to 2 meters (6,5 ft) in diameter. Output: up to 5 kg/hr (11lb/hr), heating by a tubular heating element. The spring-loaded supports soften vibration that arises while motor in operation. Due to unique and patented design, the equipment allows operation under high ambient temperature and excessive relative humidity. Design features: protected heat control adjuster, incoming power indicator (an indicating voltmeter), handles for transportation, a window for brush assembly maintenance, blue painted cabinet. Equipped with a plastic floss pan dia.660mm. Candy floss leaves the machine upwards in an even, steady and powerful flaw, allowing making cotton candy servings of unlimited size, up to 2 meters (6,5 ft) in diameter. Output: up to 5 kg/hr (11lb/hr), heating by a tubular heating element. The spring-loaded supports soften vibration that arises while motor in operation. Due to unique and patented design, the equipment allows operation under high ambient temperature and excessive relative humidity. Design features: “Quick Start” button, protected heat control adjuster, incoming power indicator (an indicating voltmeter), handles for transportation, a window for brush assembly maintenance, blue painted cabinet. Equipped with a plastic floss pan dia.660mm.